OpenNebula 5.0 ‘Wizard’ Beta Released! 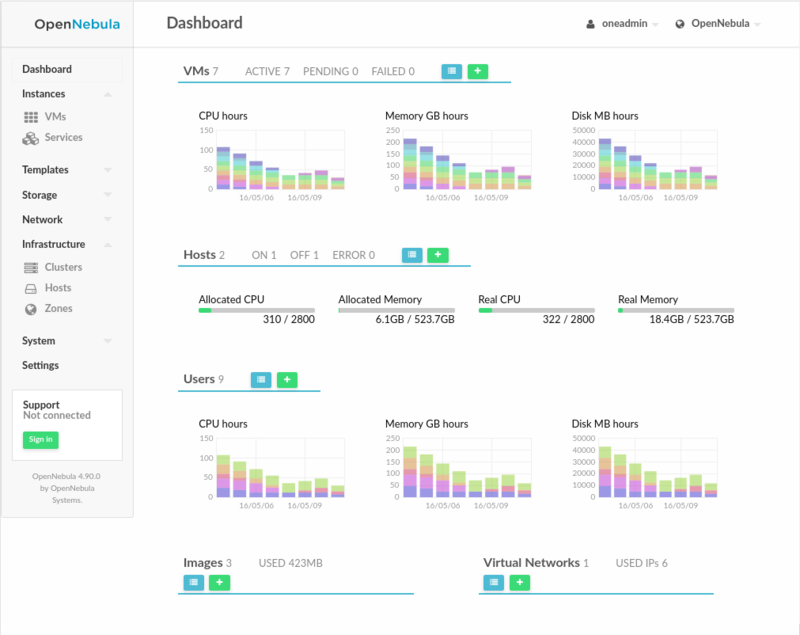 The OpenNebula project is proud to announce the availability of OpenNebula 5.0 ‘Wizard’ Beta. This major update comes with several improvements in different subsystems and components, with minimal changes in the API and the VM life-cycle states, which embodies long overdue changes but implemented to minimize the impact and ensure backwards compatibility as far as possible. A myriad of outstanding new features make their debut in Wizard. Sunstone never stops evolving, and this is the look and feel the team is most proud of to date. Since sharing, provisioning and consuming cloud images is one of the main concerns when using Cloud, one of the most important new features is the new revamped Marketplaces. 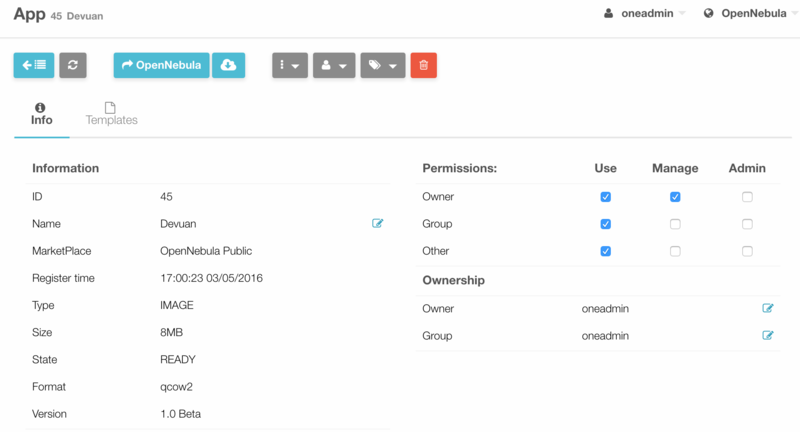 They can be seen as external datastores, where images can be easily imported, exported and shared by a federation of OpenNebula instances. Native support for Virtual Routers is also great news in 5.0. 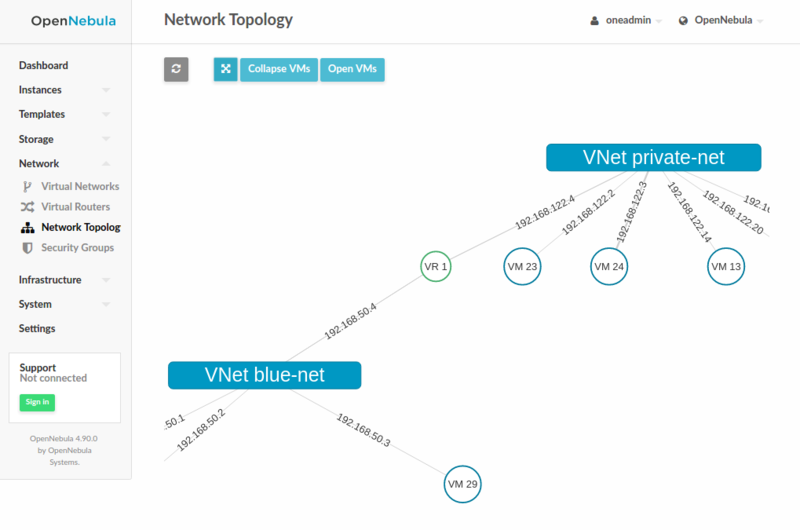 Virtual Routers are an OpenNebula resource that provide routing across virtual networks. The routing itself is implemented with a VM appliance provided by the OpenNebula installation, which can be seamlessly deployed in high availability mode. This functionality is available for the VDC administrator, which can then join together virtual networks within her VDC. For large scale deployments, a long overdue feature is the ability to group resources using labels, which is now present in Wizard’s Sunstone. This new feature will enable the possibility to group the different resources under a given label and filter them in the admin and cloud views. For vCenter-based OpenNebula clouds, 5.0 is good news! Support for vCenter storage resources like Datastores and VMDKs enable a wealth of new functionality, like for instance VMDK upload, cloning and deleting, VM disk hotplug, choose Datastore for newly launched VMs and many more. Also, support for resource pools comes in this new major update, as well as the ability to instantiate to persistent (also available for KVM), all packed in an optimized driver. There are many other improvements in 5.0 like dynamic context regeneration, new host offline mode, cluster resource sharing, VM configuration update, renamed VM life-cycle, support for DB change, improved KVM, vCenter, and datastore monitoring, better VNC port number assignment, dynamic security groups (this is a very nice to have! ), support for qemu guest agent, improved VM life-cycle naming and operations, updated instance types for the supported public clouds, improved LVM drivers, enabling use of Ceph without a shared filesystem for system datastore, a humongous number of improvements in all areas and dialogs in Sunstone, enhanced OneGate component to report application metrics, and much much more. Also, and as usual, great effort was put in this release to help build and maintain robust private, hybrid and public clouds with OpenNebula, fixing reported bugs and improving general usability. Check the full list of changes in the development portal. This OpenNebula release is named after NGC 7380 (also known as the Wizard Nebula), an open cluster also known as 142 in the 1959 Sharpless catalog (Sh2-142). This reasonably large nebula is located in Cepheus. It is extremely difficult to observe visually, usually requiring very dark skies and an O-III filter. The OpenNebula team is now set to bug-fixing mode. Note that this is a beta release aimed at testers and developers to try the new features, hence not suitable for production environments. Feedback is more than welcome for the final release. Virtual Routers functionality was funded by Unity in the context of the Fund a Feature Program. Host offline mode, Marketplace, cluster resource sharing and Ceph as system datastore functionalities were funded by BlackBerry in the context of the Fund a Feature Program. https://opennebula.org/wp-content/uploads/2018/11/opennebula_cloud_logo_white_bg-4.png 0 0 Tino Vazquez https://opennebula.org/wp-content/uploads/2018/11/opennebula_cloud_logo_white_bg-4.png Tino Vazquez2016-05-18 11:58:212016-05-18 12:00:17OpenNebula 5.0 ‘Wizard’ Beta Released!